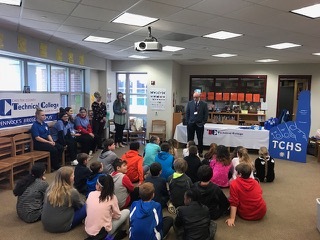 To help fifth grade students understand the relationship between personal interests, education, training and the world of work, a career exploration event was organized and facilitated by staff and students at the Technical College High School (TCHS) Pickering Campus. The event took place from 1:00pm to 3:15p.m. at Octorara Intermediate School. TCHS staff and students facilitated four 45-minute rotations. Each rotation began with a 30-minute student interest and career inventory lesson. An interest inventory depicting several pictures organized into boxes was distributed, and students were instructed to circle as many pictures in each box that would complete the sentence, “I would like to…” It was then explained to students that boxes with the highest number of circled pictures indicated careers that might match their interests. Results of the activity were discussed and this led to conversation about career programs at TCHS. The remaining 15 minutes were spent with students taking turns playing job charades and included informal discussions about each job. TCHS students enrolled in Health Career Pathways and Criminal Justice and Police Sciences programs and who attended Octorara in middle school helped with the event. They arrived in uniform, explained what they are learning in their CTE programs and shared their career goals. The students also described “a day in the life” at TCHS. 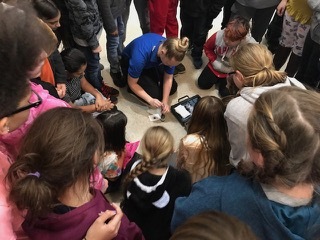 A Criminal Justice student spoke about her plans to become a police officer and fingerprinted fifth grade students interested in this career area. Finally, the students fielded questions from the fifth grade audience. TCHS staff provided an ample supply of giveaways including TCHS cups, pens, pencils, carabiners and promotional flyers about upcoming events including their summer camp. They also displayed a large TCHS banner, tablecloth and “TCHS #1” foam finger to create a festive and professional atmosphere. 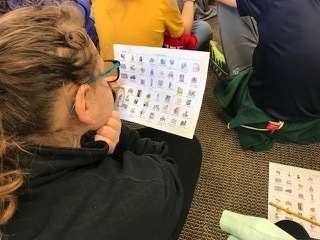 TCHS staff (Perkins Project Coordinator and counselor) and Octorara staff (counselor and principal) organized the event and were mindful of selecting activities that would engage fifth grade students while also helping them to reflect about their interests and possible career goals. Students appeared to enjoy the activities and were attentive. For those interested in replicating this event, organizers recommend early planning and ongoing communication between the CTC staff and intermediate school staff. This early intervention approach to career education reached 180 fifth grade students. Through this program, students were encouraged to explore career interests and learn about career pathway opportunities at TCHS through fun and engaging activities. The event also provided an opportunity for several TCHS students to practice public speaking skills. The activity was deemed a success and is expected to continue.